Lenox Gold Coast Round Platter, 16"
The Gold Coast Aluminum 16" Round Platter will add shimmer to any buffet or dinner table. 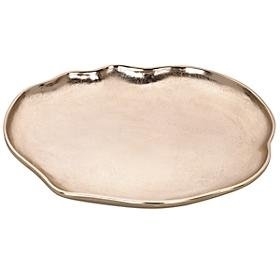 A generously sized serving piece for both formal and casual dinnerware, this elegant platter is also an impressive design accent for a china cabinet, cocktail table, or home bar. A wonderful gift.